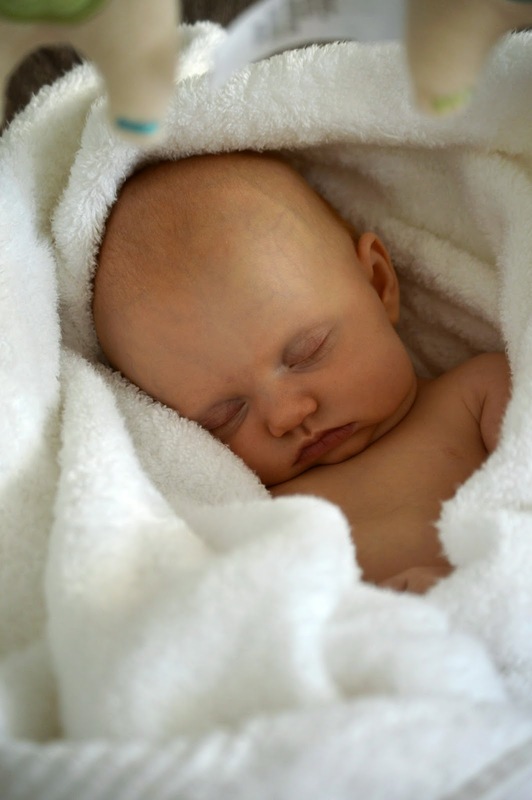 The Life of Bon: Two Month Update: We've Got a Little One! Today June had her two month appointment. I have been very curious to know exactly how much weight she's put on. She's certainly no sumo wrestler, but I have started to see some fat on her little tummy, some rolls on her thighs, and maybe, even maybe, a double chin? Turns out she hasn't been gaining the weight I had hoped. She IS gaining and her progress is steady, but she's not doing the catching up that she's supposed to be doing. "Her growth is good considering how little she was to start with. She just remains steadily behind. She's not gaining or losing. Just behind," said the doctor today. It sounded exactly like what my doctors would say when she was in the womb- always two or three weeks behind. Never falling more behind than that, just steadily behind. I have to admit that it is frustrating to go to doctor's appointments, both when I was pregnant and now, and hear over and over again how little June is without knowing if it's a real problem (versus if she is just naturally a small person) or knowing any real solutions. I felt like today was a rerun of a script I have heard so many times: She's small. She's growing. But she's not catching up. We don't know what to do about it. We'll keep an eye on her. "Keeping an eye" on a baby essentially means nothing, and I'm kind of starting to think that June will never "catch up." And that maybe that's ok? I was a puny little kid. In elementary school my friends dubbed me "Scrawny Bonnie." In seventh and eighth grade I got cut from the volleyball team because I couldn't come close to getting an overhand serve over the net. I had these skinny little arms that just had no power in them. Greg was no giant himself. I don't think he even hit puberty until after he'd graduated from high school. Maybe we just got together and made ourselves a very small human? I mean, someone's gotta be in the first percentile, right?!? Why not June? I suppose what is most frustrating is that I don't feel like June is unhealthy at all. Until I go to the doctor. Then all of a sudden I get put into panic mode. She eats every three to four hours like clockwork with the exception of night time when she will go six to eight hours. She guzzles her milk with passion. She acts full and satisfied when she is done. Her belches would give any twelve pound baby a run for his money. She is pleasant and content almost all day long and rarely fusses. She takes two to three hour naps three times a day. You can't say those are signs of a malnourished or unhealthy baby. And yet every time I go to the doctor there is this worry put on me. All I know for certain is that I have seen and known lots of babies with plenty of extra poundage that don't act nearly as happy to be living in this world as June is. I leave you with a fist pump. Because seriously. 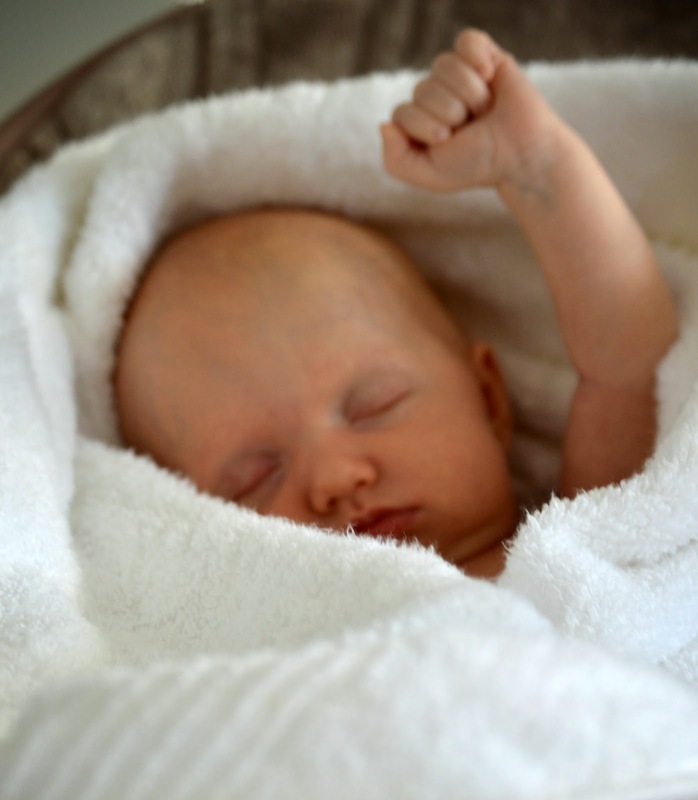 My baby fist pumps in her sleep. This is my biggest frustration with doctors visits. I'm a small person. My in laws are small. Of course my kids will be little. My son was in the .13% at one point, and my daughter, at 18 mo. Is only 16 lbs. and they're totally healthy and growing and active, so I guess what I'm trying to say is go with your gut. If you feel she is healthy, don't stress. If you're worried, ask to run some tests. You know June best and you're the boss! I wasn't as small as June was, but I WAS the smallest baby in my family and now I'm the tallest sibling, whereas Justin was one of the biggest babies of his family, and is only 5'10". Ugh, we are in the EXACT same boat. My guy is in the 3% and the doctor keeps telling us he's not gaining enough. It's so frustrating! They can't tell us if anything is wrong or what the problem is (if there is even a problem). I feel your pain! I think my guy is just perfect and then bam we go to the doctor and its stress overload! Bonnie, I am an M.A. and I have worked in a Ped's office for three years. From my work experience as well as my first son, I can tell you with 100% assurance to not worry. My first son, who is now in the MTC, was 5 lbs 13 oz at birth, and in the 5 percentile. He remained in that percentile for height and weight until well over 18 months, when he was still only just under 20 pounds. He is now 6 feet but still very thin. And perfectly healthy. Here's the thing....it doesn't matter so much where they are at specifically, it matters where they fall on the charts as time progresses. As long as she remains in the same percentile, and doesn't drop off from that, she is growing at a consistent rate for HER. If she were to stay at that percentile for several months and then suddenly drop, they would be concerned. You said it all...she's eating well, sleeping well, I assume peeing and pooping well, hitting her milestones, right? She is small, that's it. There is nothing wrong with that! Keep doing what you're doing and keep going to her well baby check-ups and enjoy her! Isn't it frustrating when other people make you worried about your sweet baby? She is beautiful and happy, and I don't think you should worry one bit! It's just like you said... someone is going to be that 1%. Looks like you just have a tiny human on your hands. A healthy, tiny human. I say trust your momma instincts. She's eating. She's gaining. Her growth is consistent, just smaller. Love her fist pound, she is precious! I'm not a doctor nor do I have children, but to me it just makes sense that some babies are just smaller than others, and if she's eating well and acting happy and healthy, that she is fine! My sister's baby was 2 weeks early and was 4 lbs 13 oz at birth. She, too, has been consistently small, regardless of how much she eats. She's 9 months and 14 lbs, but perfectly healthy. Just like in the above comments, I think if they are growing 'consistently' and don't fall behind further, then I'm sure she's fine. It is kinda crazy to see a 9 month old who's the size of a 3-4 month old, crawl, though, I tell you. Hurts your mind a little bit. Sorry to hear that the doctor's is a discouraging place for you right now. She looks like a rock star to me! I don't know anything about babies, but I feel like if she's eating consistently, she should be fine? I don't know. All my sisters and I were super tiny growing up. We still are pretty small people. However, my husband is 6"4 and was a 9lb baby. so that will be interesting. Hugs to you. I know exactly how you are feeling. When we left the hospital with our daughter, she was five pounds even. I spent the next year stressing about her weight, falling off the charts, etc. All because the doctors were trying to use scare tactics and making me think I was starving her. (Her stats are virtually identical to June's at that age). I wasn't, and logically I knew that, but the doctors kept me stressed. I ended up nursing her until 17 months, and she never changed on her growth curve (in the 1-3%) no matter how much she ate. Now she's five, and she's the size of a three-year-old. But she's healthy and happy, so now I don't worry. Sorry for the story I wrote there. June is a cutie pie! It's hard not to get nervous when you go to the doctor, but I promise it'll be okay. I hear you!! we have a lil one too and I hate going to the doctor. She is 7 months old and is still a tiny one and I doubt she'll ever catch up!! Yep I'm with Rachel. Doctors always stressed me out about Axel and I KNEW he was fine. He's 20 months now, and eats like a grown man and is still on the small side. First of all, that picture is everything. She is so cool. Second, I can't relate - I'm not a mom, and I was not a tiny baby... BUT I'm thankful for your willingness to share your struggles and your thoughts as you venture into motherhood and am inspired by your positive spunky attitude and spirit. Thumbs up, momma. Thank you Karen! Here's to making our own curves! Thank you for that Hayley! I really appreciate you saying that- it means a lot. Thank you for sharing your story! It helps to hear from so many who have been in similar situations. The "she's so small!" thing does get annoying, right? At first I was like, "I know, right! How cute!" and now I'm just like, "CAN IT!" Fourteen weeks early?! WOWZERS! How much did he weigh when he was born? Oh my goodness, get ready to have big babies! I heard there's a correlation between husband's size and size of baby. YIKES! Thank you! She's always a rock star in my book. Bahaha! I hope June starts walking when she's ten pounds- that will really freak everyone out! Thank you, Julia, for that reassurance! Those are terrific! Thanks so much for sharing. I didn't realize that exclusively breast fed babies were smaller- I always hear how great it is for babies, I just assumed it would make them bigger. Who knew? Amen! A baby who is working on fist pumps can't be worried about plumping up her thighs, right? Thanks so much for the comment, Natalie! Thank you so much! It helps so much to hear others' stories. It just seems funny to me to think "As long as she stays in the first percentile she's fine", but I guess that's the way it is. And she's so gosh darn happy all the time, it almost seems unnatural to worry about her. Isn't it the worst? I wish they wouldn't tell us of potential problems unless they could suggest potential solutions. How interesting! So now direct relation between baby size and adult size, huh? This made me laugh. Thank you Krystal. Wow, not even on the charts? I didn't realize that was possible! So good to hear, though, that he grew up out of it. She's fine! Growth curves are dumb. Sadie is off the charts and the doc practically told me she's obese and I need to put her on a diet. I think she's fine. I hate the dang growth charts. Let's just judge the babies on how they look/act/feel right?! My son was always under the normal percentile and now, at 11 years, he is taller than some of the other kids at school. I just never let it worry me. As long as she keeps growing and eating, she'll be perfectly fine! Thanks Rachel! I really appreciate this feedback. .13%- wow! I didn't realize they did such specific percentiles. So good to hear I'm not alone! Oh my gosh, seriously? A one year old on a diet? What are you even supposed to do- let your kid go hungry? That's nuts! Exactly! Also I work with a Vicki Garrett- you share your name with a great teacher! Wow! I can't believe that! That might be the littlest baby I've ever heard of. These photos of her are adorable and she sure is cute!